This week, I've been working like mad to finish a couple of projects plus the first issue of The Wonky Press (my newsletter comes out tomorrow, Oct. 1 - you can subscribe on the right sidebar if you are interested!). I made this wonky cross quilt as a sample for my Wonky Cross Class at Rock Paper Scissors on October 28 (registration is open!). It was so incredibly gratifying to make. Beth, RPS shop owner and my friend, suggested the Modern Background Paper line by Zen Chic as a low volume background. 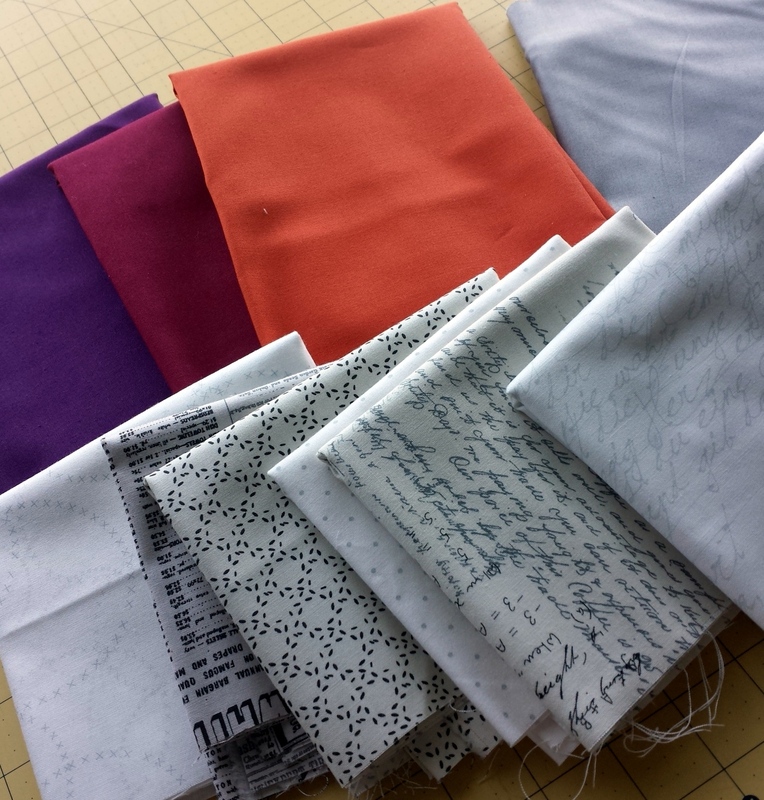 I was only too happy to shuffle through her stack of bolts to choose several fabrics. I wanted the crosses to pop against the background, so I chose bright solids (sorry, I didn't write down which solids they are). I was really feeling the red, orange, and purple that day (probably because I love fall and fall. is. HERE!). Look at those text fabrics!! Wow. I've said it before and I'll say it again: if you want to try improvisation, this is a great technique to start with. You could fill each spot with a wonky cross if you wanted. I chose to leave negative space in each row to give it a more randomized/modern look. One cross in each row is skinnier than the others, too. But really... there are a million options for wonky crosses! Try them!! In the class, I give instructions for piecing a backing like this out of your extra fabric. Quilt picture outtake: It came out blurry but it looks kind of cool. Also, there's another quilt behind me, and a storm is coming! Or maybe it's just Mordor. I love it! 1 week?!?! That's very impressive!! A beauty!! Great job with the quilting too!! It's great, and the spiral quilting looks like the perfect choice. I love the text fabrics and appreciate the quilting tip. What a great quilt! Love the Zen Chic Background Papers - I haven2 chrm packs of it that I can't wait to use! 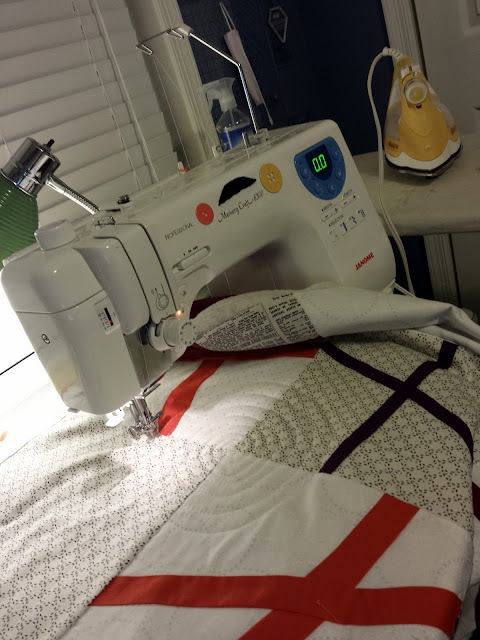 Your crosses truly pop and your quilting is amazing! Nice jib!! This is awesome!!! And I completely agree -- great introduction to improv. I still have a bunch of cross blocks somewhere in the madness waiting to see the light of day again... Good luck with your class!!!! That looks great! I'm in love with the back and the awesome quilting you did. Great job! You're definitely an inspiration to me and were I can only hope to be in the quilting world one day. Thanks for sharing and always posting! Looks great Jess, I like the way there are a couple of empty blocks (no cross) and good job with the spiral! I think an off-centre spiral would certainly look cool too! Wow, I really like it! I yet have to make a quilt which I intend quilt in circles. You gave me some inspiration here!! Love these colors together, and the LV background is perfect! Looks like such a fun quilt to make, I bet the class will be so awesome.